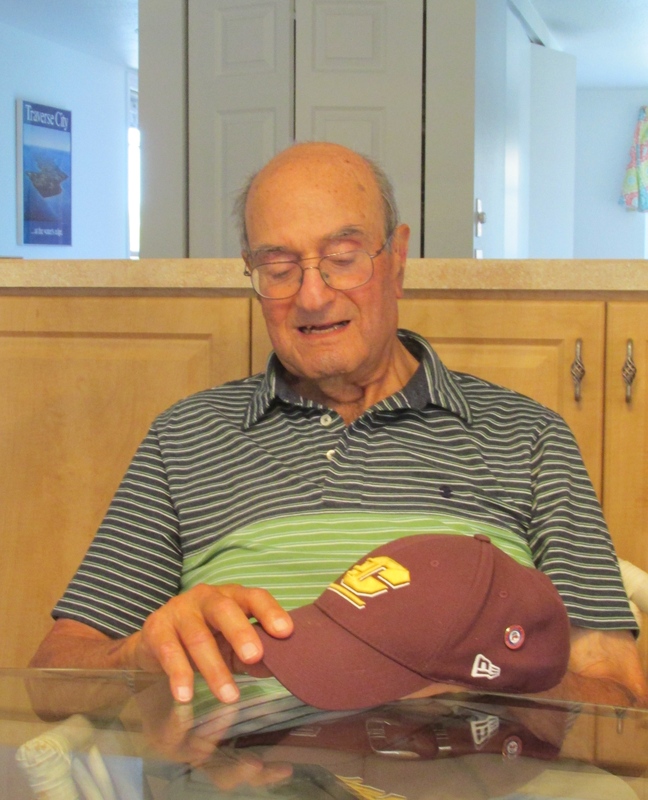 Shortly after graduating from high school in 1943, Clarence Tuma was drafted into the Army, went to basic at Fort Stuart, Ga. and traveled by ship to Europe as a member of the 789th Anti-Aircraft Artillery Battalion. “When we got to Southampton, England we knew something big was about to happen because they were loading up all the ships with troops,” the 90-year-old former Englewood anti-aircraft spotter said. “B-17 and B-24 bombers were flying in formation toward Europe. “We were loaded onto a troop transport and headed out into the English Channel. We were only out about 30 minutes when our ship headed for Poole Island in the channel,” he recalled. “Our duty there was to set up our 40-mm anti-aircraft guns to protect the invasion force from enemy aircraft. A German plane never came our way. “After Poole Island our unit was sent back to London to act at guard at SHAFE (Supreme Headquarters Allied Expeditionary Force). This was Gen. Dwight Eisenhower’s headquarters for the European Theatre campaign located in Bushy Park in the northeastern part of the city. How did the Germans know about Tuma and his unit? “Darn if I know,” Tuma said. By the time Tuma and the 789th landed in Normandy, France, Gen. George S. Patton’s 3rd Army had taken the Cherbourg Peninsula and was moving along the “Red Ball Highway” further into France fighting the Germans every step of the way. They eventually reached Lier, Belgium. “It was a beautiful little medieval town that hadn’t been bombed. The Belgium people loved the Americans, particularly the children,” Tuma said. “The weather was bitter cold and snowy when we set up our 40-mm anti-aircraft guns in a farmer’s field at Lier. His gun crew shot down a ME-109 (German fighter) and a JU-88 twin=engine bomber with their 40-mm gun. They were good. “I began dating this Belgium girl. I couldn’t speak much Flemish and she could only speak a few words of English, but she invited me to meet her parents and have dinner at her home. We were just about to sit down to dinner when their was a knock at the front door. A soldier was at the door looking for me,” he recalled. “He told me I had to return to my gun because the Germans were on their way toward us. I had to give up dinner, romance and go back to war. “We went from Lier right to ‘The Battle of the Bulge.’ We were maybe 40 miles away from the Ardennes Forest and the Germans. We were transported in Army trucks towing our anti-aircraft guns. At the same time much of Gen. (Omar) Bradley’s 1st Army was headed the other way on the same road running away from the fighting. 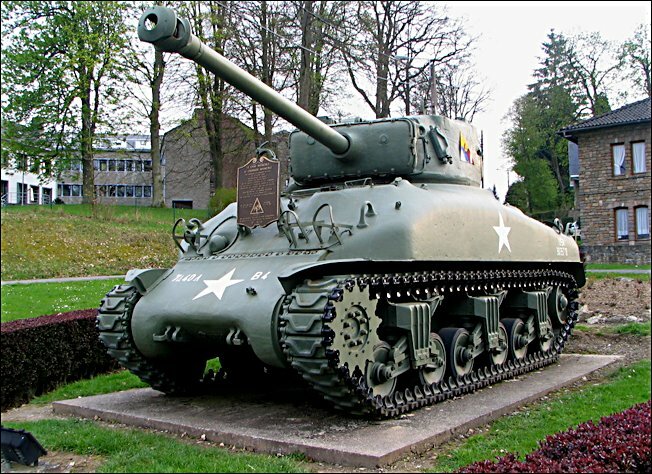 “We arrived at St. Vith, Belgium and hooked up with Patton’s 3rd Army, but saw little action initially. Our lieutenant told us we were surrounded by the Germans and had to move. “We spent 31 terribly cold days in the Ardennes Forest with our guns waiting for the German counter attack. This is where I lost a lot of my crew because our men were scattered throughout the forest. Day and night we slept in miserable foxholes in the Belgium woods,” he said. By early January the weather improved, the German had used up their fuel moving their armored divisions forward and their advance stalled. American tactical air support was beginning to go on the offensive once more. P-47 “Thunderbolt” fighters carved up Panzer units. At this point, Tuma and his artillery unit outfit headed for Malmedy, Belgium. 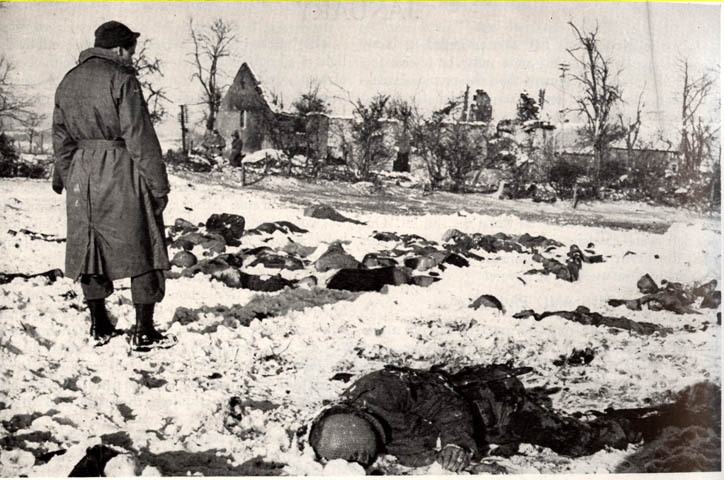 American POWs captured by Germans and murdered by Col. Joachim Peiper’s 1st SS Panzer Division in December 1944 reached the crossroads at Malmedy and attacked an American 30-vehicle convoy of the 285th Field Artillery Observation Battalion. They were waiting for the Germans to attack when Tuma and his buddies heard a massive amount of enemy machine-gun fire. At the time they didn’t know it was Peiper’s troops murdering the American POWs. The bodies of 84 American soldiers slaughtered by the enemy were later recovered in a snowy field where they fell. “I was standing in the middle of the road checking civilians trying to escape the Germans when a 1st lieutenant rolled up in a Jeep and called me over. “He told me to bring all the non-commissioned officers over to his Jeep. “We thought that was kinda different, but we didn’t understand why until we heard about the ‘Malmedy Massacre,” Tuma explained 70 years later. Col. Peiper was eventually tried by an Allied military court martial and sentenced to be hanged along with 19 of his SS soldiers for the massacre. He was granted a reprieve from hanging and spent the next 11 years in prison for the murders. In 1956 he was released from prison and spent the next 20 years living in France. He was murdered in his home on July 14, 1976. Peiper’s charred remains were discovered in his burned down home. There was a bullet in his chest. No one was charged with his shooting. “By January 1945 the Germans were retreating as we headed for the mountains attached to the 7th Armored Division. It was our job to protect the unit from attacks by enemy planes,” he said. “We saw very few German planes, but the 7th Armored was attacked by a couple of British ‘Spitfire.’ I gave the order to fire on the two fighter planes. We shot ’em down. “It wasn’t long after that we got a call for headquarters wanting to know if we shot down a couple of British fighters. I told the caller we had. Because I was the airplane spotter I was taken to 1st Army Headquarters and given a quiz on airplane spotting. I knew my planes and passed it without a hitch. I was sent back to my unit and I never heard anything more about the incident,” he said. About the time the war in Europe ended, Tuma was assigned to food services with 1st Army because he had worked in his father’s butcher shop and grocery store back in Michigan and cooked for his outfit while in the service. “The Army wanted me to run its kitchen because of my cooking experience. With the help of three or four good looking German girls and several buddies, who worked with me, we ran their kitchen for several months at Wiesbaden, Germany. After the war Tuma took the G.I. Bill and graduated from Central Michigan University with a degree in Physical Education. He planned to coach, but the college had other ideas. It hired him as its food service director, a post he held for five years before going in the restaurant business on his own. For the next 50 years, until he retired in 2001, he was the owner of “The Embers” restaurant in Mount Pleasant, Mich.
Tuma has five children: Jeff, David, Mary Beth, Amy and Scott. He and his second wife, Mary Ann, began vacationing in Florida the winter of 1998. Commendations: Combat Infantryman’s Badge, World War II Victory medal, European Theatre medal, Good Conduct medal. This story was first published in the Charlotte Sun newspaper, Port Charlotte, Fla. on Monday, April 6, 2015 and is republished with permission. Click here to view Tuma’s collection in the Library of Congress VHP. A fascinating account. I knew very little of the Malmedy massacre until a few years ago from a Tv film. Such a. tragic ending for those men. If you search this site with “Malmedy” you’ll find a few other first-person accounts of the aftermath. 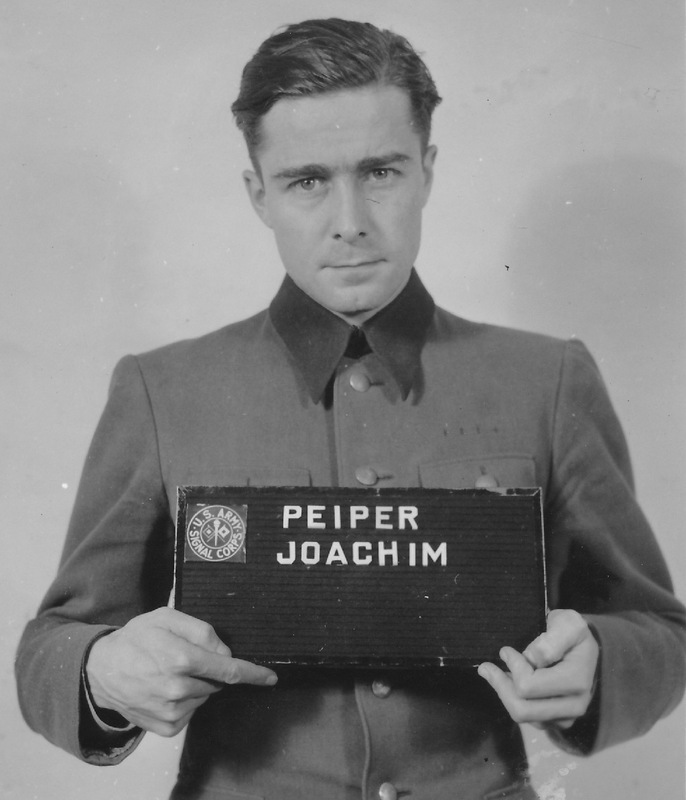 Photo caption indicates that Joachim Peiper was hanged yet the article itself and information sources from elsewhere show that he was not hanged. We messed up on that one – thanks for the heads-up.